The Tamiya Mercedes Actros Gigaspace in 1/14 scale is a radio controlled truck with a realistic ladder frame and a 3-speed gearbox. The suspension is equipped with solid axles with leafsprings just like full scale trucks. The 2012 Truck of the Year award-winning Actrosseries is the flagship of the world's leading truck manufacturer, Daimler. Its latest installment, the rear-wheel drive Actros1851 GigaSpaceruns on a 12.8-liter6-cylinder turbo-charged engine generating 510hp and is used for long-distance haulage, heavy duty distribution haulage, construction haulage and so on. This impressive model joins the tractor truck model line-up. 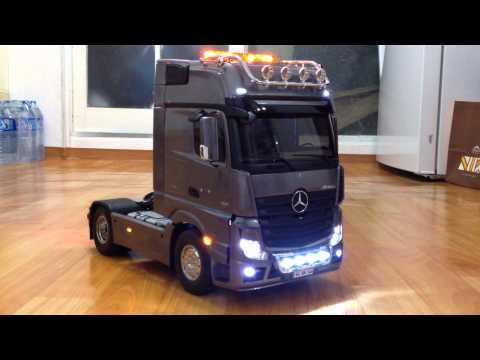 This is a 1/14 scale assembly kit of the Mercedes-Benz Actros1851 Gigaspace. Length: 458mm, Width: 195mm, Height: 305mm. Ladder frame chassis can be linked with a semi-trailer via coupler. Highly-realistic suspension recreated with metal leaf springs and friction dampers. Built-in differential gears enable smooth cornering. LEDs can be used to accurately recreate the truck's front and rear lights. Enjoys superb driveabilitythanks to its float-mounted die-cast front axle and reinforced resin rear axle. The powerful form of the truck and its splendid interior are faithfully captured. Attach any of Tamiya's 1/14 Tractor Truck trailers to the Actros 1851 GigaSpace for an exciting combination. A wide variety of Tractor Truck Option Parts are available for you to furthercustomize your machine. Very good price. Very quick delivery to France (2 days). Main concern is the payment site which refused several time my credit card. I had to add "Mr" before my first name which was not written on my card! My first Tamiya truck build. It looks great.